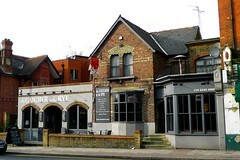 A refurbished modern pub near Finchley Central Station, in Finchley. Inside, the pub is set over several levels and a couple of rooms, with some large couches near the front. Further back, up some steps, is the bar, which opens onto both sides of the pub. Behind that, up another level, is more seating, with a mix of couches, and dining tables, as well as high bar stools. Decor is slightly bland, with stripped walls and bare floorboards, under low lighting photo. On a Tuesday evening visit in March 2009, the place was fairly empty, with only a handful of people scattered around the place. Service was pleasant, and the barstaff were very quick to collect empty glasses (they weren't particularly stretched that evening, though). There are three handpulls for ale, with Adnam's Bitter, Adnam's Old Ale (£3/pint), and Thwaites Bomber available on the March 2009 visit. There's also the standard range of lagers, as well as a wine list. A food menu stresses pub mainstays like burgers and sandwiches, with a good range of mains photo of menu. We didn't try the food on our visit, but at other Faucet Inn pubs Ewan has been to, the food has usually been pretty good. Accessibility: At least one step up to get in, and once you're inside there are steps everywhere. The ladies' is very cramped. Last visited by Ewan, Kake, and ilmari, 10 March 2009. Opening hours taken from website, March 2009. Last edited 2013-05-10 06:54:25 (version 9; diff). List all versions. Page last edited 2013-05-10 06:54:25 (version 9).